It is no secret that Spray Polyurethane Foam (SPF) insulation roofers encounter an array of hazards on the job, including dangers associated with working at high elevations and ladders, using power tools, contact with electricity, noise and hazardous substances, as well as exposure to extreme temperatures. In fact, even under the best conditions, roofing work can be treacherous. In addition to high elevations, unprotected roof edges and steep slopes also pose risks. These hazards increase when other factors are present, such as wet surfaces and windy conditions; equipment failure, and unsafe worker behavior. Unless an employer controls the majority of these hazards, roofing contractors risk injury and illness, and in some cases, death. Today’s roofing companies and businesses must work to protect their workers, identifying potential dangers and taking steps to address them. For starters, roofing contractors must have Personal Protective Equipment, or PPE, or roofing safety equipment they can wear to minimize exposure to a variety of dangers. This roofing safety equipment focuses on protecting the head, eyes, ears, hands, and feet. So hard hats, safety glasses, earplugs, respirators, gloves, steel-toed boots, appropriate clothing, and safety vests all fall under this requirement. Roofing professionals who work six feet or more above lower levels are at risk for serious injury if they fall. As such, companies must provide fall protection and the proper fall prevention equipment for each roofing job they take on. For example, some of the roofing safety equipment consists of an anchorage, a body harness with a D-ring, and a connecting device that connects the body harness to the anchor point, essentially acting as a self-retracting lifeline. Another important piece of roofing safety equipment regularly used by commercial roofers is a “temporary guard rail fall protection system.” This type of system features engineered base plates that keep the railings secure. Workers avoid falling when they stay on the proper side of the temporary rail. 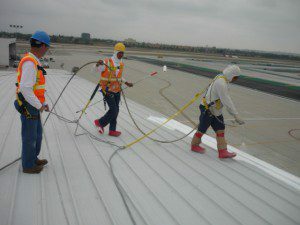 Roofing companies also need to protect workers against airborne risks on the job. For example, silicosis is a lung disease that results from breathing dust containing crystalline silica particles. According to OSHA, doctors diagnose 900 new cases of silicosis every year. As of September 23, 2017, OSHA is enforcing that any professional who is working near respirable crystalline silica receive training on silica risks. The agency also recommends providing each worker with a National Institute for Occupational Safety and Health (NIOSH)-approved N95 respirator. Protecting SPF roofers from the hazards they may encounter on the job is the responsibility of every employer. At Intech Equipment & Supply, we have a team of professionals that offers advice about worker safety and training. Our website also features an online resource center where you can learn more about using roofing safety equipment. Contact us today to learn more.